So, have you heard of “rough puff” pastry? Sometimes it’s called “blitz” pastry? I hadn’t! I’ve made normal puff pastry before but didn’t realize there was a shortcut version. 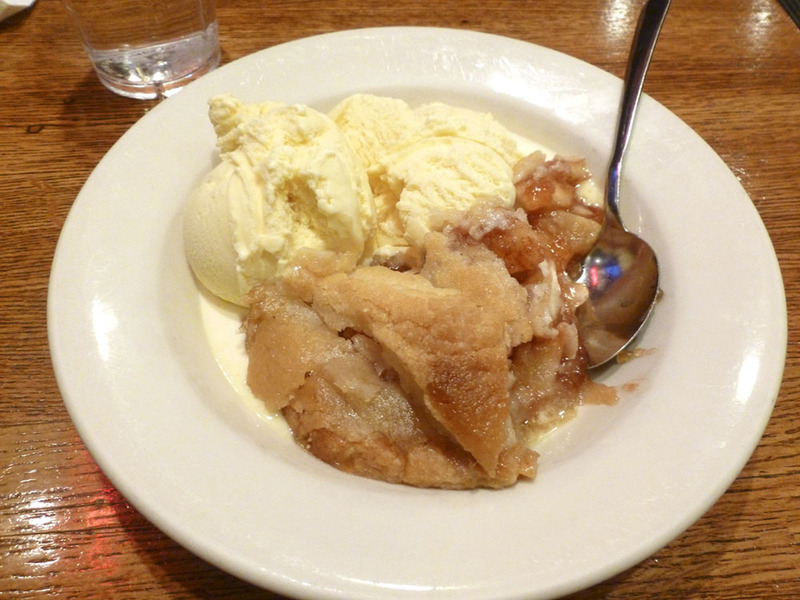 It all started when I had this amazing apple pie at one of my fave cafes here in Chicago, Third Coast Cafe and Wine Bar. The crust is just delicious. It’s not a normal pie crust as far as I can tell. But it’s not really a puff pastry, either. 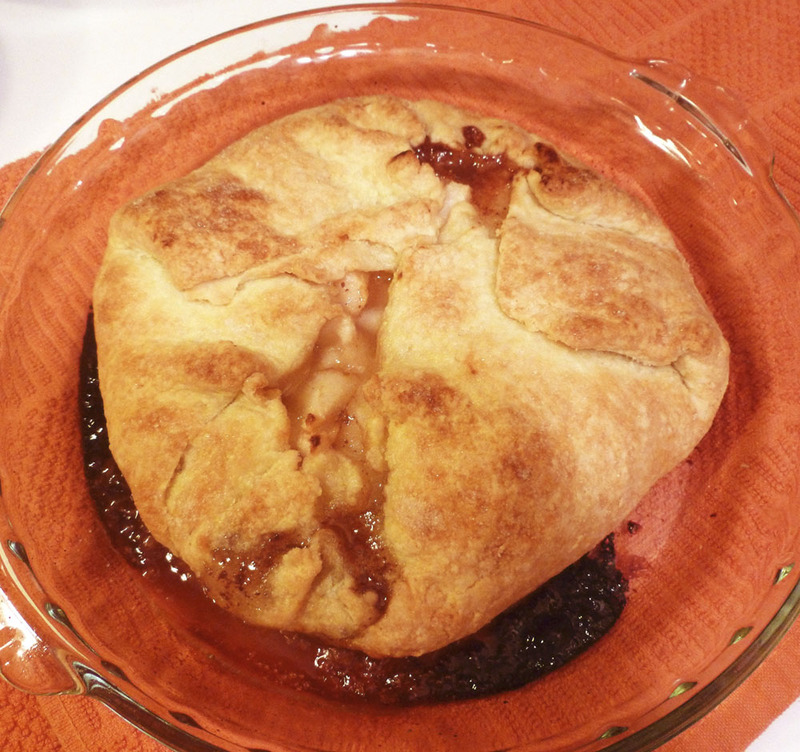 It seemed like just a puffier pie crust. So I googled “puffy pie crust” and discovered this whole other world of pastry called rough puff. 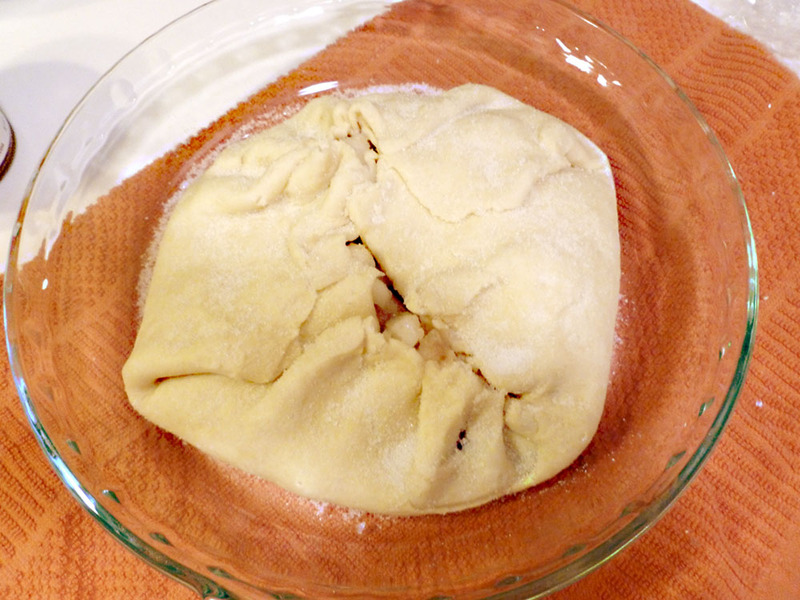 Rough puff is quicker and less puffy than puff pastry. It wasn’t THAT MUCH quicker to make than the normal kind. But I like it better, so there’s that. ANYHOW, I think maybe it’s more a European-ish thing because a lot of the recipes I found online were written in European measurements. Seeing as how the metric system never really caught on here, I searched around for one I could read. There were a few but ultimately I just made up my own. I got the gist of puff pastry years ago when I made the real kind from The Joy Of Cooking (one of the only times I read the “about” section) so I felt comfortable doing my own thing here. Basically puff pastry gets puffy because you make lots of layers of flour and butter- you roll it and then fold it, and roll it and fold it a million times to create these invisible flaky layers that magically puff up when they’re cooked. Something about water or steam or something makes that happen, I’m not really sure, I’m not a physicist. So, anyway, this is really easy to make, it just takes some time- really it’s just a lot of waiting for the dough to chill again after rolling it each time. You can figure out how to entertain yourself while waiting. I don’t know, maybe by harassing your cats or watching a marathon of that new Charlie Sheen show. But seriously, don’t buy that frozen brand name crap anymore. It’s yukky with weird ingredients. Make this instead. A big bowl, preferably metal, that you’ve chilled in the freezer for 10 minutes or so. A pastry cutter or a couple of knives. Usually when I make doughs I use my fingers but I think it’s pretty important not to get the dough warm at all here so use something metal to cut the butter into the flour. A rolling pin, wine bottle, or some other creative item you’ve repurposed to roll out the dough. A place to roll out the dough. It’s not going to get super huge but you’ll need a space that’s at least 20×12. If you have a marble pastry board, that’s just dandy, otherwise a kitchen counter or table will work. I miss my marble pastry board. 3/4 cup of very cold butter. Some recipes even recommend freezing it and then grating it into the recipe. I didn’t do that. Mine was just cold from the fridge. The butter is important here so get the good expensive kind. I’m sure some of you have access to locally grown, pasture raised, manually churned, artisan $20 butter so go ahead and use that. The rest of you can just get the mass marketed Irish one. 5 or 6 TBS ice water (since it’s winter, the water that came out of my tap was pretty darned cold so I just used that). Sift together the flour and salt into the bowl. 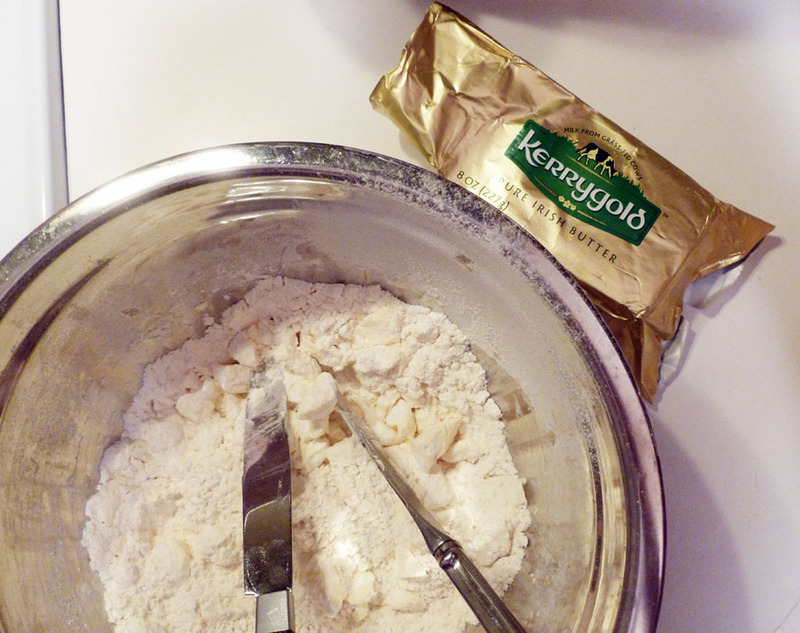 Cut the butter into small pieces then toss it into the flour and use the knives to cut it in. It should not be fully incorporated. Do it fast so it (a) doesn’t get warm, and (b) so it doesn’t get too worked over which will cause it to get sort of tough. Use the knives to cut the butter into the flour. This is about how it should look when you're done. I probably should have made some of the butter pieces a little smaller now that I'm looking at it. Drizzle 5 tablespoons ice water evenly over flour mixture and gently stir it with a fork until the water is incorporated. Test the dough by squeezing a small handful together. It should stay together without crumbling. If it seems too crumbly, add another tablespoon of water, stirring with the fork until it’s just incorporated. I did have to use 6 TBS myself. Ultimately it should hold together without crumbling, but also without being at all sticky or wet. Gather the whole thing together and form it into an approximate 5-inch square, wrap it in plastic wrap, then chill it until firm, about 30 minutes. It will look lumpy and streaked with butter. Like mine. 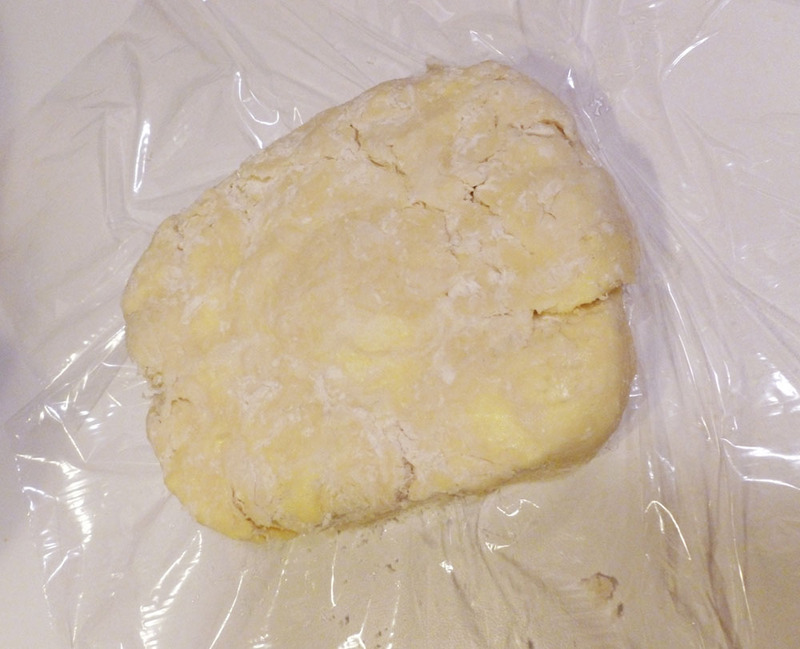 Streaky, lumpy, ready to chill rough puff pastry dough. 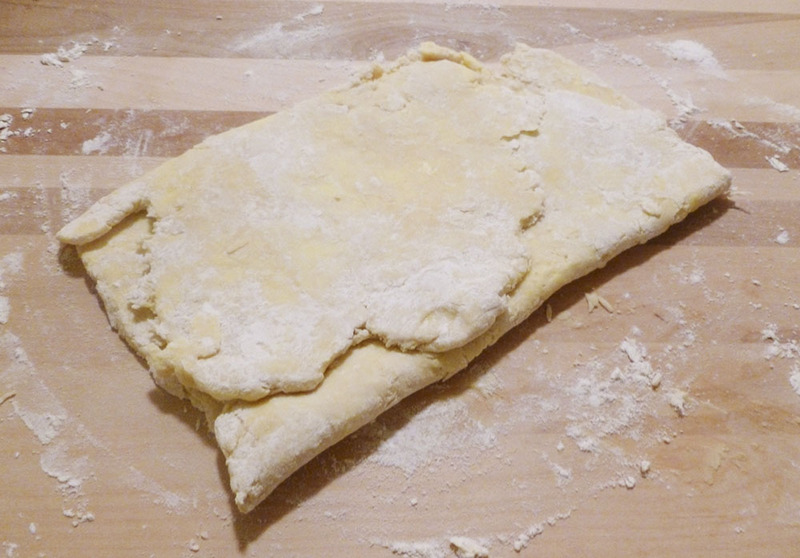 Once the dough is chilled, roll it out on a floured surface with a floured rolling pin (or your implement of choice) into a 15- by- 8-inch rectangle. Put the dough with the short side nearest you, then fold it into thirds like a letter: bottom third up and top third down over dough. If you want to be all Martha Stewart about it and make it perfect you can. Or you can do it all irregular like me. 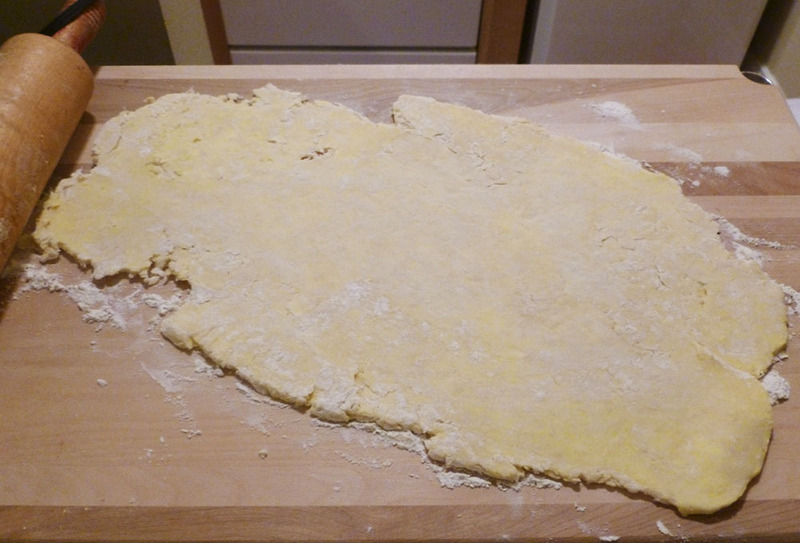 Rollin' rollin' rollin', pastry dough! Fold it like a letter. A letter. LOL. Rewrap the dough and chill it another 30 minutes. After that chilling, do the same thing with the rolling, folding and chilling at least 2 more times. The more times you do it, the more puffy it will be. Do it like 10 times and you’ll have regular puff pastry. The last time you’ve done it, when you’re sick of doing it, and want to make the pie already, just chill it an hour. You can also keep this dough chillin’ in the fri-age for a couple days if you don’t want to use it right away. Once you’re ready, just roll it out to the shape of whatever you’re going to make. You’re really supposed to chill it AGAIN at this point but I had had just about enough of Mr. Sheen and wanted to get on with it so I didn’t. This rough puff exercise was mainly so I could unlock the mystery of the Third Coast Cafe and Wine Bar pie crust (God forbid I just ask them). I hadn’t really taken it as far as to firmly decide what I was going to do with the dough till it was made. 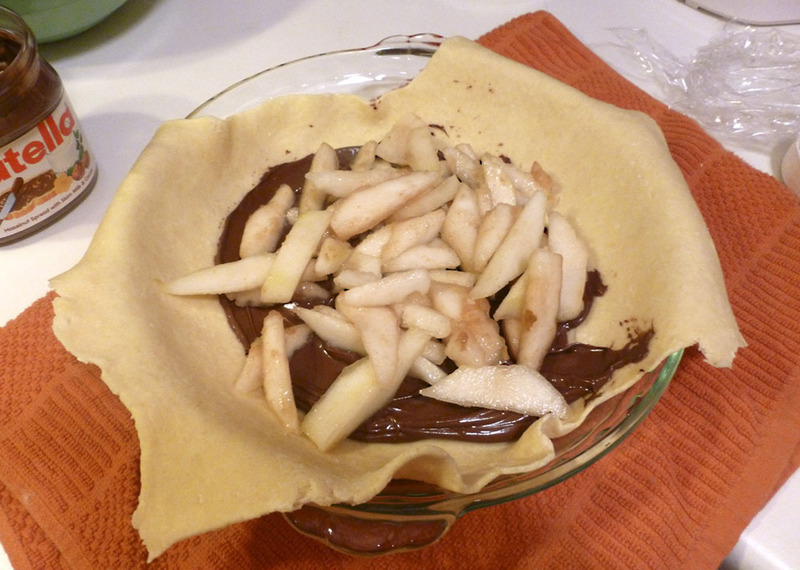 I didn’t have any apples, but I did have some pears and some Nutella. That sounded like a good combo. I used a pie pan even tho it’s not really going to be a pie per se, because that’s the only pan I have. I peeled and sliced 4 pears and tossed them in a little lemon juice. 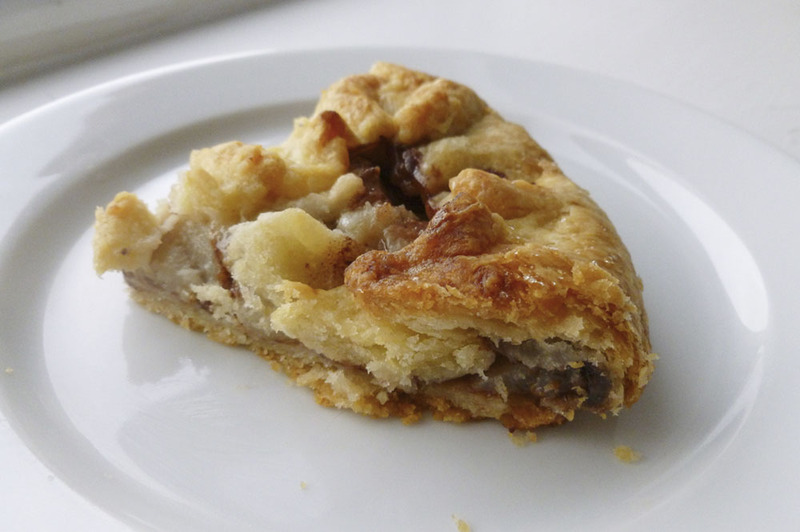 Then I rolled out the dough, spread some Nutella on the bottom, topped it with the pears, and folded the dough sort of around and over it for a “rustic” pie. I sprinkled some sugar over the top of the dough because the Third Coast pie seems to have some sort of sugery topping on it. But doh, I also messily got some sugar on the pie plate. Don’t do this. Be less messy. The sugar melts and burns and gets all unpleasant on the pie plate. 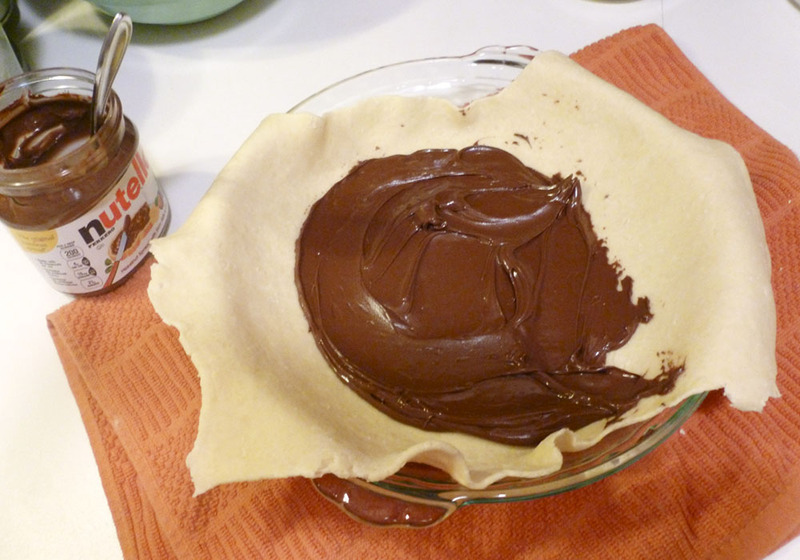 I spread some Nutella on the bottom of the pie. Then I topped it with some pears. Then folded and wrapped it. Not handling it too much or it would get tough! I baked it at 375 for about 40 minutes, checking it often. I thought it would be really good warm from the oven so we had some with vanilla ice cream. It was good, but not as good as I had hoped. So I covered it with foil and left it on the counter overnight. It was MUCH better this morning. At room temperature. For breakfast. Really delicious. So, this was really good and all, but it’s still not the crust from the pie I was searching for. The quest continues.